There is a monument called Monument Philopappos, which sits atop a hill called the Filopappos Hill that is more commonly known as the Philopappos Hill because of the monument. 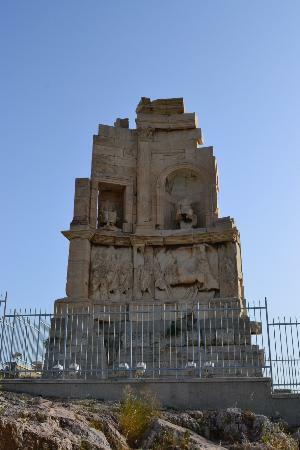 The monument atop the hill and the mausoleum were built to honour Gaius Julius Antiochus Epiphanes Philipp’s (Philopappus). The hill is one of the few places in Athens where you are allowed to visit any day of the year, and any time of the year without having to pay. From the Thissio Metro Station near the Agion Asomaton Square, take the metro down to Petralona station. It is as close as the trains will take you, as you then have a 25-minute walk via Stisikleous to get to the hill. Make your way to the Apostolou Pavlou Walkway, and follow it for a long time and you will reach the hill. It is quite a long walk, so you are probably going to have to rely on Google Maps for intimate particulars. There are a few busses that will take you a little closer, but you will still have to walk through unfamiliar streets and housing estates to get there. You may visit the hill whenever you wish. Filopappos Hill, Thissio, Athens, 104 38 Athina in Greece. When you see the hill, you are going to assume it is a very difficult climb, but once you are on the path, it is quite nice and rather easy. It will take you around an hour to climb the hill, but the views are worth the effort. The thing is that the area is free to use because local groups lobbied to keep it that way. They said that love and care would protect it better than a fence. Sadly, the result is that it is full of litter from the many tourists that make the climb. The climb up the hill may be taxing if you are not in shape, but there are four regular routes and all of them have places to stop as you climb. There are times when it is very crowded, and times when it is very quiet. For some reason, there is occasionally a crowd up there, which one assumes must be due to bus tour groups. Some of the routes up the hill are easier than others. Catching the sun rising or setting from the hill makes for a great photo opportunity.